Statistics Canada reported a small uptick in inflation from 15-month lows, to 1.5 per cent, but those numbers are still well below the Bank of Canada’s 2 per cent target. A separate report showed retail sales unexpectedly declined in January, reinforcing concerns about consumers paring back. The numbers suggest a relatively soft picture for an economy in the middle of a slowdown, with enough slack to limit any price pressures that could be a source of concern for the Bank of Canada. 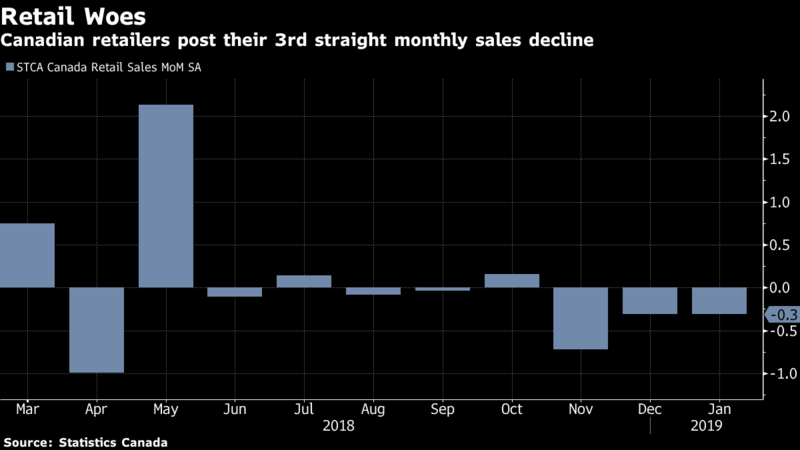 Retail sales were the big disappointment, underscoring a broader trend of slowing consumption by households as they face higher borrowing costs, moderating housing markets and volatility in financial markets. “Today brought a mixed bag of economic reports from Canada, with inflation showing a small spark but retail sales surprisingly sluggish at the start of the year,” Doug Porter, chief economist at Bank of Montreal, wrote in a note to clients. For the Bank of Canada, the main message is “rates are in lock-down mode for the foreseeable future,” he said. The Canadian dollar remained lower after the reports, trading down 0.3 per cent at $1.3402 per U.S. dollar at 9:10 a.m. in Toronto trading. Government 2-year bonds yielded 1.56 per cent, a drop of 5 basis points from Thursday and the least since 2017. Economists had predicted inflation would remain unchanged at 1.4 per cent. Core measures -- seen as a better gauge of underlying price pressures -- dropped slightly to 1.83 per cent from 1.87 per cent. The Bank of Canada anticipates inflation will remain below its 2 per cent target for most of this year, one reason it’s unlikely to be in a hurry to lift borrowing costs any further. In fact, markets have started to price in a possible rate cut. There are few signs of any price pressure in the report. Inflation in the service sector was down to 2.3 per cent in February, from 2.7 per cent the previous month. Excluding gasoline, inflation was 2.1 per cent in February, unchanged from the previous month. Food has been a major driver of inflation gains over the past year. Excluding food prices however, inflation was just 1.2 per cent. The retail numbers also showed underlying weakness in the economy, damping hopes for a better start to the year after promising January numbers from manufacturers and wholesalers over the past week. Canada’s economy stalled in the final quarter of last year, and economists have been expecting it to remain weak to start 2019. Receipts for retailers have fallen for three straight months, and for five of the past six. “After a weak December, there was at least some hope for January retailing in Canada, but hopes that didn’t pan out in the data today,” Avery Shenfeld, chief economist at CIBC Capital Markets in Toronto, said in a note to investors. On a monthly basis, consumer prices rose 0.7 per cent, more than the 0.6 per cent gain expected by analysts. The monthly gain was driven by higher prices for travel tours and cars. Gasoline prices increased 1.9 per cent during the month, the first advance since July. They have fallen 21 per cent since then.